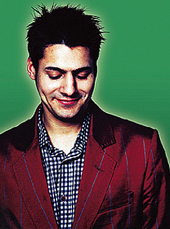 Outrageously likeable Danny Bhoy brought the 2001 season of comedy shows to a standing room only ovational end and proved why he is one of the UK's hottest rising stars. 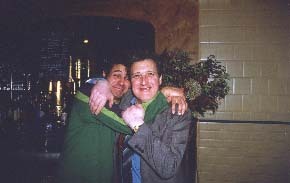 Three rafter packed, cracking nights in his delightful company. We could have added another night even but decided to have a party instead. His engaging persona fused with a razor sharp mind and stunning off-the-cuff material is nothing short of prolific. Danny's rise to headline status has been nothing short of meteoric. 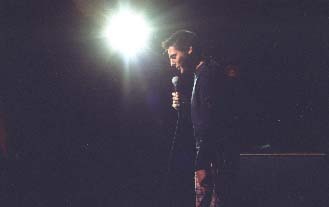 Just one year from his first ever gig (he got pisssed in a Glasgow pub and went for the open mike), he won the 1999 Daily Telegraph Open Mic Award - one of Britain's biggest comedy newcomer prizes. 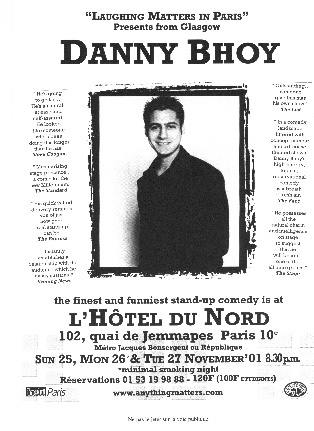 He rapidly built on this success with barn storming appearances at the Melbourne, New York and Montreal "Just for Laughs" Festivals - the latter of which brought forth understandable massive US industry interest. Absolutely brilliant!!! 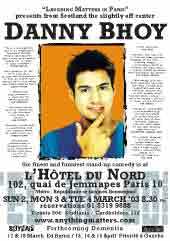 I was really impressed by Danny Bhoy's quick wit, and his provocative messing with the audience (especially when being heckled!). I'd recommend him to anyone and it's not just me who thought he was good - two Frenchies, a German , an Aussie, an Irishman and a Japanese that came with me all had a great time. Next year's too far away!! Rob T.B. He's a natural, at ease and self-assured. He looked like someone who's been doing this longer than he has." Steve Coogan.